The Original & Genuine TORNADOR BLACK Z-020S (NEW Edition) - Professional Surface Cleaning Gun Interior & Exterior - Made In Germany. New & Improved for 2017. Minimises the need for strong chemicals. Perfect for hard to reach areas. Relies on less air consumption. 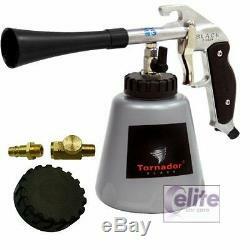 Tornador Black Z-020S Car Cleaning Gun. The Z-020S Tornador Black is the new version of the ever popular Z-020, with a number of improvements over the previous version for a more reliable and better overall tool. Professional detailers will love the speed and effectiveness of the Tornador Black Z-020S. The new design reduces wear and ensures a longer life and superior performance with lower maintenance. The Z-020S Tornador Black produces enormous power with a very small air compressor. All you need is a compressor with a discharge rate of at least 270 l per minute (9.55 cfm). This can be achieved using compressors with a reservoir of as little as 50 litre capacity. Mobile detailers can now use the Tornador Black with a smaller, portable air compressor. The Z-020S Tornador Black is less noisy, too. The designers increased power but reduced air consumption and noise. Plus, the Tornador Black d is equipped with sealed ball bearings inside the rotation set. Wear is minimized because the rotation set no longer comes into contact with the cone. This improvement makes the Tornador Black better suited for long term, frequent use, as in a professional detailing capacity. New improvements over the previous Z-020 include. New trigger: allows 1 or 2 finger operation without squeezing the ring finger. New side caps: to provide a non-slip grip and freeze-protection and to reduce hand/arm vibrations. New air inlet: 32 degree angle prevents bending of compressed air hoses, perfect angle for swivel joints. New recessed cup grips: for a better grip and easier opening of the cleaning cup. New level indicator: facilitates precise mixing of Tornador cleaner, ensures a constant overview on the current level. New valve: improves the pressure equalization in the cleaning cup, allows overhead work. Ergonomic, freeze-protection and less vibrations. Suitable for 2.2 kW-240V piston compressors. The rotation-set is equiped with sealed ball bearings which enable the Tornador Black Z-020S to work with small or mobile compressors because the full performance potential is already available at just 4.5bar. Wear is also minimised because the rotate set does not come into contact with the outlet cone like traditional air cleaning guns. The Tornador Black Z-020S can be used for all the same applications as the Tornador Classic, but the Black is more effective on persistent spots, like chewing gum. The cone-shaped nozzle and oscillating tip create a tornado cleaning action that cleans hard and soft surfaces like nothing youve seen before. Dirt and grime are immediately released from fabrics, carpet, and solid surfaces. The Tornador Black Car Cleaning Gun releases a fine mist of cleaning solution that does not over saturate surfaces. Youll see the liquid turning dirty as grime is released from the surface. Wipe with a microfiber towel. Then turn the dial to shut off the water and use the compressed air to dry the cleaned area. Use the Tornador Black Z-020 on the dashboard, door panels, steering wheel, fabric upholstery, carpet, floor mats, and between seats. It cleans in tough-to-reach places between seats and in seams. Because it releases so little liquid, surfaces dry quickly. A video of the gun in action is available to watch here. Not recommended for use with strong solvent based products (eg Autosmart G101). 1 x Gun including bottle cap cover, air hose connection & compressed air control valve. We only use the best carriage services. Please Note: 100% Satisfaction Guaranteed. The item "The Original & Genuine Tornador Black Z-020S Professional Surface Cleaning Gun" is in sale since Sunday, November 16, 2014. This item is in the category "Vehicle Parts & Accessories\Car Accessories\Car Care & Cleaning\Other Car Care & Cleaning". The seller is "elitecarcareuk" and is located in Maidenhead, Berkshire.